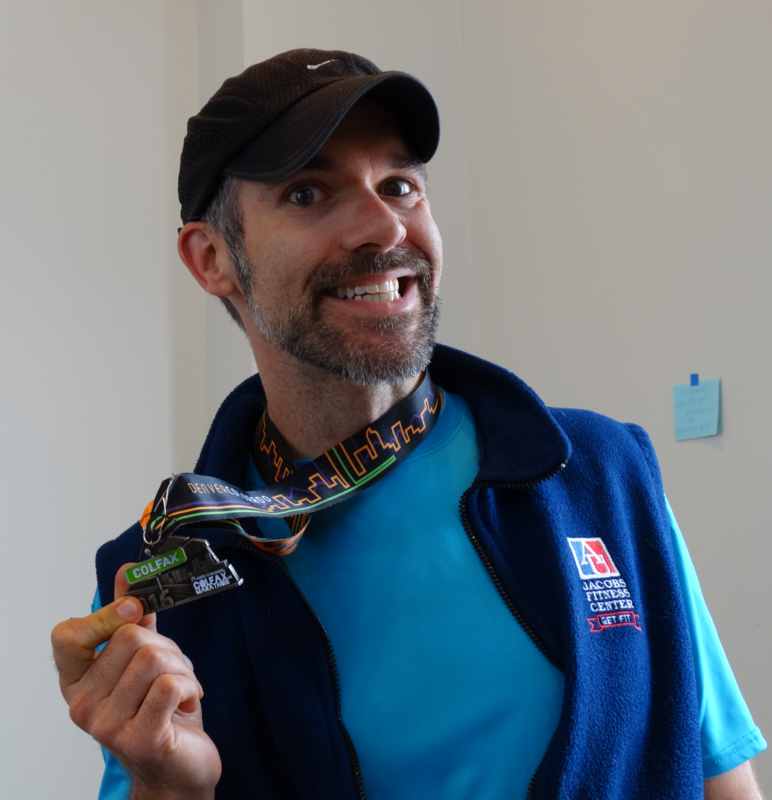 The Colfax Marathon, half-marathon, 10-miler and marathon relay happened on May 15 and here’s a quick update on things. I ran the 10-Miler to help raise funds for The Gathering Place which is a Denver shelter for homeless women, their kids and the transgender community. I’m very pleased and grateful that a total of $2343 was donated by my tremendously generous friends, family and clients. My original goal was $2000 and I’m thrilled to have gone over that goal. It’s all going to a very good cause that helps a vulnerable segment of my city. I look forward to helping The Gathering Place again in the future. Post-race strangeness and a medal. I won’t be winning any ribbons or prize money any time soon, but I’m very pleased with those results. Eight minutes per mile was my most optimistic hoped-for pace. This was on a course that started downhill and ended uphill. In three of my last four miles I averaged just under 8:00/mile. That’s pretty decent, I think. Several things went well. First, it was a cool, cloudy day. Heat dissipation is a massively important thing for good running performance. I’m about 200 lbs. so I generate a lot of heat and I need all the help I can get. My training went well. I ran the most I’ve ever run over the winter. 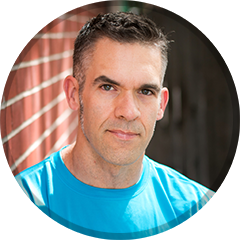 I built a plan based loosely on the Hansons Marathon Method. I did speed work one day a week, tempo work on another day and a longer run on the weekend. In between those main workouts I was typically running shorter slower runs to build my aerobic abilities. These short/slow recovery runs were vital! They weren’t “junk miles.” They had a purpose which was to condition my aerobic energy system. I think it’s likely that more such running will help me be faster in future races. I tapered the week before the race by cutting distance but I kept some of the intensity of the speed and tempo work. I replaced some of the runs with bike rides as well. Finally, I believe I did a good job of maintaining a sensible pace at the beginning of the race. It’s always easy to launch out of the gate, run too fast, then crap out in the second half of a race. That didn’t happen. I ran within my limits and I was able to put on strong finish. What I love about running is that there’s always room for improvement. There’s always an opportunity to do better than last time. Some time (sooner rather than later I hope) I’m going to enlist a running coach to help me get better. I’d love to run a sub-8 min/mile 10-miler or maybe half-marathon. I am very fortunate to be able to live a safe, secure, healthy life with supportive people around me. I want for very little and I have a lot for which to be grateful. Many others in this country live in far less desirable conditions than I. In May, I’ll get do something that I enjoy (running) and help people who are in need. I think I’m like a lot of people in that I know I should and I could do some charity work. For all sorts of lazy reasons it seems that at the end of the week/month/year I haven’t done much. Thus I’m very pleased that the process has been made easy for me. Betsy’s Cupboard: Members may receive 25 lbs of food per month as well as toiletry and hygiene items. Bridget’s Boutique: TGP’s clothing bank features items for members donated by the community. Family program: Our Family Program provides a safe and fun space for children under 18 to be while at The Gathering Place. Staff also provides resources and referrals specifically targeted to families. Housing stabilization: TGP’s only case-managed program, our Housing Stabilization Advocate works with members seeking long-term, sustainable housing options. Nap room: 6 beds are available for napping on a first come, first served basis. Clean linens provided. Community resources: The 1st Floor Resource Desk is a great place to learn about wider Denver Metro area resources. If what you are seeking is not at TGP, our Resource Advocates will do their best to connect you with where you need to go. GED classes: The Education Classroom hosts GED Class twice a week and holds on-site testing periodically. Job readiness: TGP’s Job Readiness program offers support with résumé assistance, interview prep, and job seeking. The Card Project: Members create original artwork to be sold as greeting cards at TGP and by local businesses. Seventy-five percent of each card sale goes back to the artist. The Writer’s Group: The Gathering Place has two writer’s groups that meet weekly on the 3rd Floor – one for technical writing and one for creative writing. Open art: Open Art time gives members freedom to explore creative self-expression and experiment in a variety of mediums. I’m asking for your help. If you want to donate then a suggested minimum amount is a $20 pledge ($2 per mile.) You can follow this link to my donation page. Any donation you can provide will be greatly appreciated.